Spray and let stand for 1 to 5 minutes. Wipe or scrub. Low foaming so it’s easy to rinse. For tougher jobs, let stand up to 15 minutes. Then scrub and rinse. Repeat if needed. The formula in our 1 gallon and 5 gallon sizes is concentrated, making them economical choices. Dilute with water 10 to 1 for light cleaning, 4 to 1 for normal cleaning, and full strength for tough cleaning. Apply and let stand 1 to 5 minutes. Then wipe or scrub and rinse. For tougher jobs, let stand up to 15 minutes. Repeat if needed. 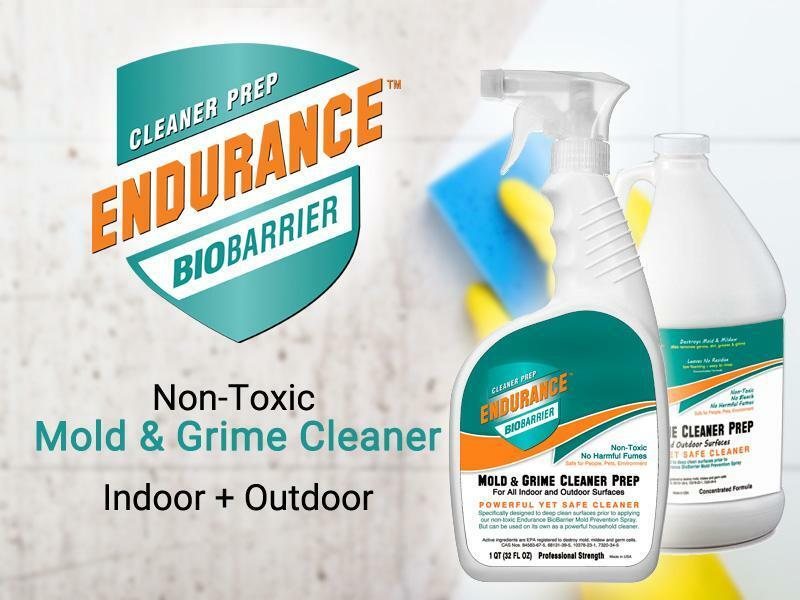 Perfect for deep cleaning before applying our non-toxic Endurance BioBarrier Mold Prevention Spray. A thoroughly clean surface maximizes the microscopic adhesion of our innovative Mold Prevention Spray, helping it prevent growth in bathrooms for up to 6 months and up to 2 years on indoor/outdoor surfaces. Other mold products get rinsed away when first exposed to moisture, forcing you to frequently clean away re-growing mold. Safe for all surfaces. Tile, grout, drywall, wood, painted surfaces, metal, plastic, fabric, etc. Anywhere you want a clean, great looking surface. Cement, bricks, gutters, roofing tiles, siding, metal, wood, glass, RVs, boats, canvas, you name it. There is no job too tough for our Cleaner Prep. And it’s biodegradable, so no worries about harming the environment. The perfect, safe cleaner for any job large or small. Easily removes mold, mildew, grease and grime. Our Cleaner Prep’s water-based formula is safe to use on all indoor and outdoor surfaces. And since it is non-toxic with no harmful fumes, you don’t need to open windows or use expensive protective gear to apply it. Our formula offers powerful cleaning results, yet has no harmful fumes (zero VOCs) and is non-toxic. Since our Cleaner Prep is biodegradable, you don’t need to worry about harming plants, animals or the environment when using it on indoor or outdoor surfaces. Use our Mold Prevention Spray to protect any indoor/outdoor surface through 100’s of wet-dry cycles! Guaranteed 6 months to 25 years of protection! Non-toxic.